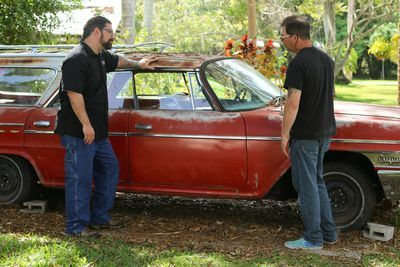 Every guy's ultimate four-wheel fantasy becomes his worst nightmare when he is forced to choose between the cash he desperately needs and the classic ride he always knew his clunker could become in Discovery Channel's all new series, HIGHWAY TO SELL premiering on September 1 at 10PM ET/PT. Across America, neglected classic cars are waiting to be restored and make their way back onto the street. Enter Dennis Pittsenbarger and "Slick." Over the years, automotive expert Pittsenbarger has made a name for himself in the car world. A walking encyclopedia of automotive history and design, Pittsenbarger is a long-time race car driver with a working knowledge of nearly every car make and model ever made. His partner in chrome, mechanical mastermind Slick, has retooled hundreds of cars in his 12,000 square ft. Florida shop, and created period-perfect movie cars for Hollywood Films. Rather than just buying broken down vehicles from their owners, the pair deals differently. 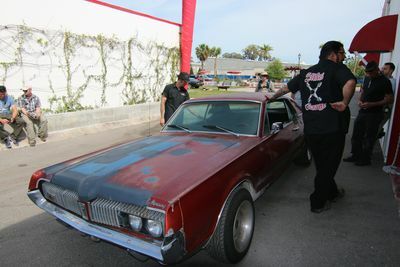 Dennis, Slick and their team spend their own money and time working to restore the car to its former glory. However, once they are done, the car goes to auction where the owner has a difficult choice to make: take a cut of the profits, or buy their cherished ride back at a discounted rate. Will the owners choose to let go of their beloved classics and walk away with the cash, or will the thought of seeing their dream car in the hands of another be too much to handle? It's cash vs. classics in the all new series, HIGHWAY TO SELL. HIGHWAY TO SELL is produced for Discovery Channel by Twelve02 Television, where Jim Casey is executive producer. For Discovery Channel, Joseph Boyle is executive producer with Todd Lefkowitz as associate producer.